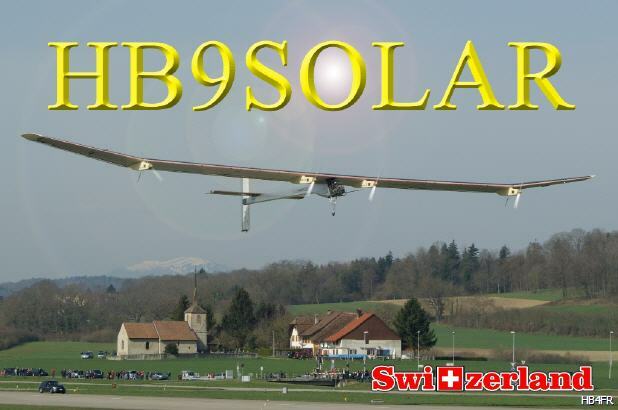 Our Club has an amateur radio license for the special call sign "HB9SOLAR". This callsign is used for special events related to solar technology projects. 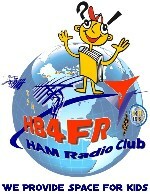 All QSO with the radio call sign HB9SLOAR will be confirmed with a special QSL card. Nowadays we work feverishly on the realization of various visionary projects using solar energy. Two major Swiss projects, Bertrand Piccard's "SolarImpulse" aircraft and the solar catamaran "Planet SolarTuranor" by Raphaël Domjan have already accomplished their main goal, the circumnavigation of the world. Raphaël Domjan is currently working on his second project, the "Solartos Stratos" mission. We try to be QRV with our special call sign "HB9SOLAR" whenever solar projects like "Solartos Stratos" are in action for testing, respectively to try to achieve other ambitious goals. The mission, called SolarStratos, aims to become the first inhabited stratospheric solar flight in history. It will improve our knowledge and develop technologies for a sustainable world. SolarStratos is a symbol of pioneering spirit, dream and innovation for demonstrating the potential of renewable energies and energy efficiency. The purpose of the SolarStratos mission is to allow each and every one of us to approach the space, to see the stars in broad daylight, to observe the curvature of the Earth, all this from an aircraft operating exclusively solar energy and hydrogen. This ambitious project aims to demonstrate, on the one hand, our know-how and, on the other hand, to market a possible application of solar aircraft. Those who will have the chance to make such a flight will also become ambassadors for renewable energies. The first commercial flights are scheduled for 2020. After his non-stop flight around the World with the “Breitling Orbiter 3” - balloon, the Swiss Bertrand Piccard completed a revolutionary new adventure. I was about to fly aroud the World in an solar-energy powered aircraft. 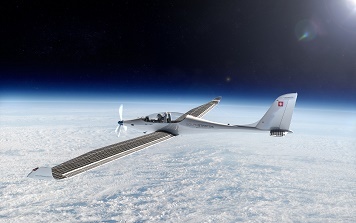 The prototype Solar Impulse HB-SIA had already completed an intercontinental flight between Switzerland and Morocco and back, and a Continental flight from California to New York. As of May 2014, the definitive aircraft HB-SIB has completed the flight tests. On March 2015, Piccard and Borschberg circumnavigated the globe with Solar Impulse 2, departing from Abu Dhabi in the United Arab Emirates, traversed Asia by June 2015 and completed the longest part of its journey, from Japan to Hawaii. There, the aircraft's batteries had to be repaired, took months. Solar Impulse 2 continued the circumnavigation in April 2016 to California continued across the United States to New York, where the plane arrived in June 2016. Still in June, Solar Impulse 2 crossed the Atlantic Ocean to Spain and from there back to Abu Dhabi on, where the plane landed on 26 July 2016. The entire journey of approximately 42,000 kilometers took more than 16 months, using only solar power. HB4FR was always present on our bands during all flight activities of SolarImpulse 1 and 2, in particular also during the circumnavigation. PlanetSolar is a multlihull vessel topped by a large array of photovoltaic solar panels, constructed by Knierim Yacht Club, in Kiel, Germany. Built in 14 months, the biggest solar boat ever built has impressive dimensions and is yet both silent and clean. The goal was to navigate around the world at an average speed of 7.5 knots — no mean feat for a solar-powered craft. The vision for the "Solar Planet" comes from Raphaël Domjan, a mountain guide and rescue specialists from the Swiss Neuchâtel. He plans to take the Frenchman Gerard d'Aboville as helmsman and co-captain in 2011 with the giant catamaran around the world. The surface of the solar catamaran "Planet Solar" is covered with a little less than 500m2 of solar panels, which provide the energy for the propulsion. The vessel has a length of 30 meters and a width of 16 meters. It will sail with a speed average of 8 knots (about 15km / h). On 27 September 2010 Tûranor PlanetSolar started on a journey around the world in Monaco. With this expedition, the iniatiors of the project would like to focus the public awareness on the importance of renewable energies for environmental protection. After 584 days, Tûranor PlanetSolar returned to Monaco on 4 May 2012 after sailing around the globe. On the first solar boat expedition around the globe, the Tûranor PlanetSolar has reached two records: fastest crossing of the Atlantic Ocean by solar boat and longest distance ever covered by a solar electric vehicle.